Gout Prevention: What Are You Trying To Prevent? We all want gout prevention. But do we know what we are trying to prevent? Modern pain management techniques mean we can prevent most pain. However, many gout studies have shown that stopping pain is never enough. Unless we stop the underlying cause of gout pain, uric acid crystals, we will see get gout get worse. Preventing the awful pain of a gout flare today is one thing. Stopping uric acid deposits from destroying joints and growing until they burst through the skin is another. Skin is not the only organ at risk. My tophi guidelines reveal that tophi can lead to kidney disease and heart disease. All organs can be damaged by uric acid crystals. I understand that, when you are in pain, you just want the pain to stop. We have seen from the investigation into the high cost of Colcrys dosage, that gout pain prevention with daily pain relief is very common. Do you have unexplained lumps? We have also seen that failure to stop uric acid deposits growing leads to horrendous disfigurement. 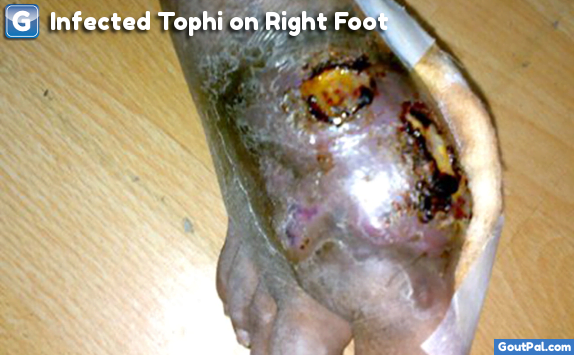 Wounds caused by tophi bursting through skin can become infected. Worse than that, the uric acid deposits prevent joints from repairing themselves. Joint destruction from tophi is inevitable. For this reason, I do not see preventative pain relief as a valid type of gout management, though it can have a limited place in a good gout treatment plan. There is only one goal for gout prevention – get uric acid to 5mg/dL (0.30mmol/L) or below. 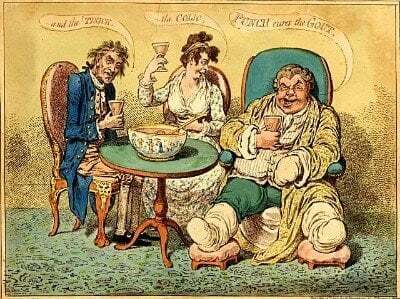 Though I prefer the pharmaceutical approach, I accept that many gout sufferers seek other ways, and so I have created 3 different subsections within GoutPal that explain the details. Before I look at the details of the different methods for lowering uric acid, I must explain the principles that underlie all the methods. You must know your uric acid number at all times. Test blood at least once per year, and whenever treatment changes. You must have a uric acid target. Long term, this is 5mg/dL. Short term, it might be much less than this in order to dissolve uric acid deposits as fast as possible. You must be prepared for gout flares during the first few months of uric acid lowering. This is the only time you should consider daily pain prevention. I explain gout medications to lower uric acid in the Gout Treatment section. Allopurinol is the main treatment. Personally, I recommend that you discuss taking the maximum possible for the first year of treatment, then review with your doctor. This is the fastest way (other than using the new Krystexxa) of dissolving the uric acid crystals that destroy your joints. Natural gout cures appeal to many gout sufferers. A growing number of natural products are being investigated for their uric acid lowering potential. Though this is an alternative method of gout prevention, it is only valid if you follow the principles. You must manage by reference to uric acid levels. Pain, or the absence of it, is not a valid measure of successful gout prevention. Besides failing to monitor uric acid, the other major failing of the natural gout cures approach is that products can be inconsistent or ineffective. As we see in gout medications, dosing is a big issue that many professionals fail to get right. The natural approach is very challenging, as is controlling uric acid through diet. There is no single measure you can take for preventing gout through dietary means. First, I must stress the principles again. You have to monitor uric acid levels. Third, where you identify any of these excesses, use food charts to replace worst offenders with better alternatives. You need to study the gout diet section in detail to take account of all the factors of food that can affect gout. Now you understand what gout prevention means, you are ready to create a gout treatment plan. You might also need a gout diet plan. Note that you can include elements from each of the gout prevention methods. Thus, you might require a lower dose of allopurinol if dietary improvements lower your uric acid levels by one or two mg/dL. For the pharmaceutical approach, read about allopurinol and it’s alternatives in the gout medications pages. For the natural approach, read the gout cures pages. For the dietary approach, read the Gout Diet section.